When we got to the a section of the Roaring Brook, we stopped to take some photos. I got to practice the Brenziner effect. April brought more rain but also more opportunity to be outside. I have picked up my exercise. Though I will admit not as much as I should be doing and I know I need to do much more. The issue is trying to deal with the stress in my professional world, relaxing enough by the time I get home, and then going out for a nice walk o hike sometime after dinner just to let my body relax a bit and get the exercise it needs. However, I also know that the winter months bring cold, wet, and gloomy skies and I will not be motivated for any outdoor activities. With that in mind, my wife and I agreed to buy an exercise bike. We did some online research, looked at Consumer Reports reviews, visited a store to try out different bikes, and ultimately purchased a Schwinn IC2 Bike from Amazon. I set myself the goal of working out for about fifteen minutes every evening. My goal is to work my way up to thirty minutes, then sixty minutes, and for a stretch goal, bike ride from my home to the local brewery. I am motivated. We had some excellent weekend weather for the Easter weekend. 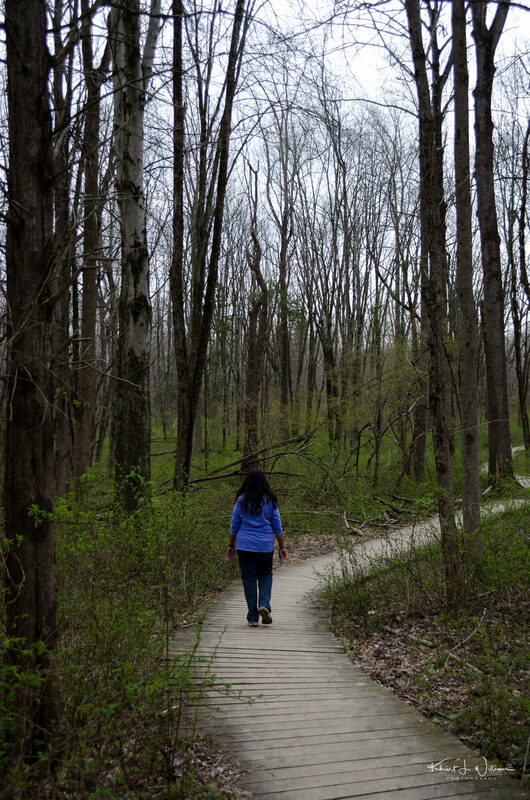 On Good Friday, my wife Bhavna and I went for a hike in the Sourland Mountain Range. We drove over to the Sourland Mountain Preserve, located between Hillsborough Township and Montgomery Township in Somerset County. The large parking area near the pond was nearly full. I think local residents wanted to enjoy the incredible spring weather we have had this week. Clear, sunny skies with temperatures in the teens (ºC). Located in Somerset and Hunterdon Counties, the Sourland Mountain Range is aptly named. The underlying geology, igneous rock from the Late Triassic and Early Jurassic age, was not able to support the farming and living needs of the early Dutch and German settlers to the area. One Wikipedia suggests that the name may be derived from the word ‘sorrel’ which German explorers used to describe the reddish-brown soils in the area or “sauer landt” because the region was not suitable for farming by 17th-century Dutch settlers. 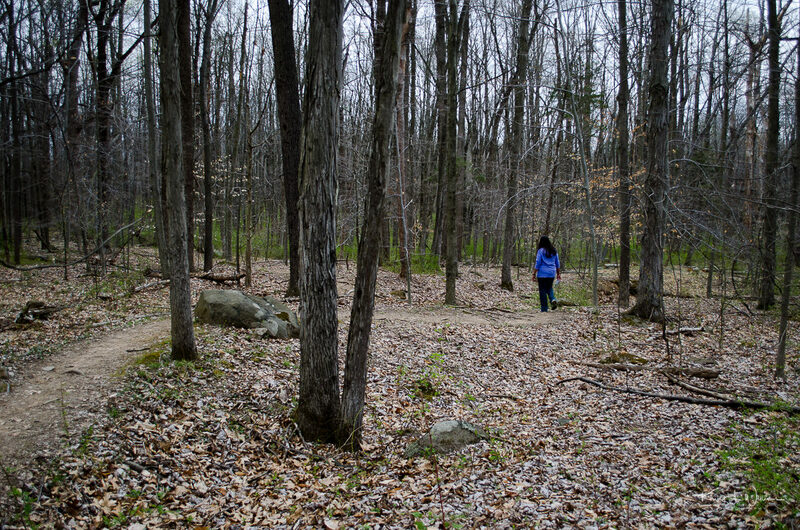 We have hiked other trails in the Sourland Mountain Preserve but we wanted to try something new. I suggested that we hike the Ridge Trail to Devil’s Half-Acre Boulders, the most popular bouldering area in the Sourland Mountain Preserve. Devil’s Half-Acre Boulders is a fairly open section of the mountain with a cluster of boulders among the trees. There is also a handful of isolated boulders nearby the main cluster which I could not resist climbing. It took us about 30 minutes get to the boulders of Devil’s Half Acre, with the trail winding steeply through interestingly shaped rock formations with trees growing through cracks and crevices. The park is 12.24 km2 (3,025 acres) but we used one of the connecting trails to shorten the trip back from Devil’s Half-Acre Boulders. We hiked about half of the 8.0 km (5-mile) Ridge Trail. According to my iPhone, we hiked about 2.6 km and climbed the equivalent of 21 floors. My calves ached from the exercise. 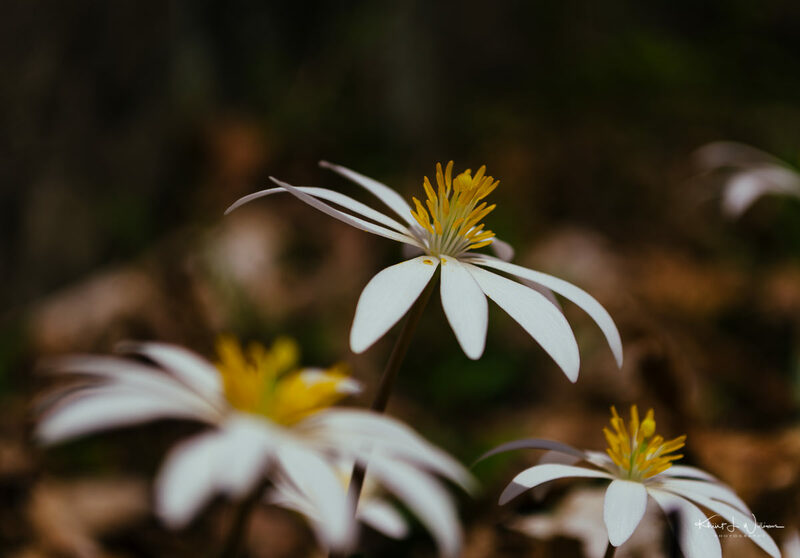 Along the sides of the trail, I saw a number of wildflowers including Spring Beauty, Rue Anemone (thalictrum thalictroides), and Bloodroot (sanguinaria canadensis). Bhavna was annoyed each time I stopped to focus my camera and take photos. The slight breeze made handheld focusing challenges. 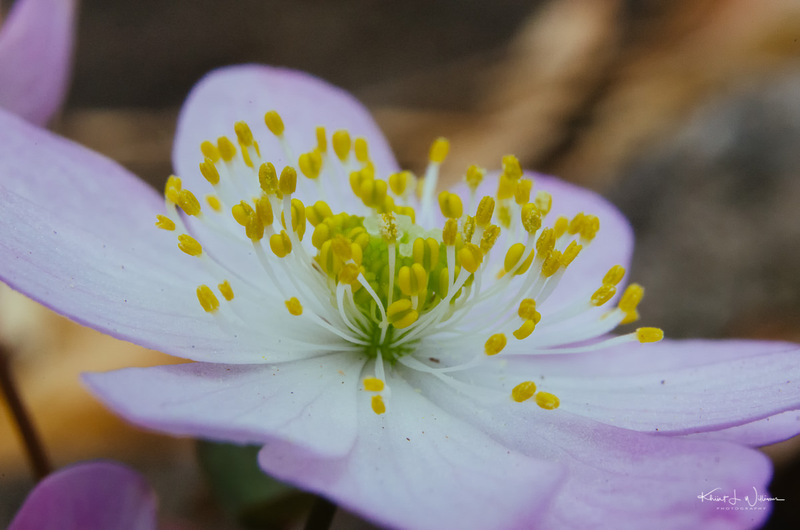 I had the AF-S DX Nikkor 18-55mm f/3.5-5.6 G VR lens with attached macro extension tubes but even using my miniature Manfrotto PIXI mini tripod required patience and persistence. The smallest movement in the subject (or my hands) was exaggerated and the photos would be blurry. Bhavna felt my photography was slowing us down but in actuality, it gave my body a chance to rest. At one point, my blood glucose fell below 70 and I had to swallow twenty carbohydrate grams of glucose gel. Stopping to take some photos helped my body recover. We took the shortcut across a boardwalk back to the trailhead and discussed our plans for the next day. We decided that we would return and complete another Sourland Mountain Preserve trail. 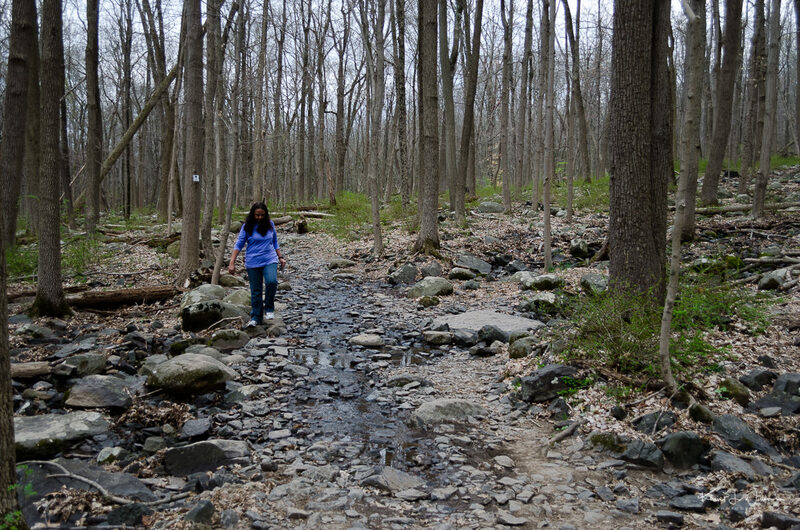 Bhavna had never visited the Roaring Brook but a few years ago, I hiked that trail with my friend Prasanna. I enjoyed the walk and it made me realize I truly do want to get back into nature more. 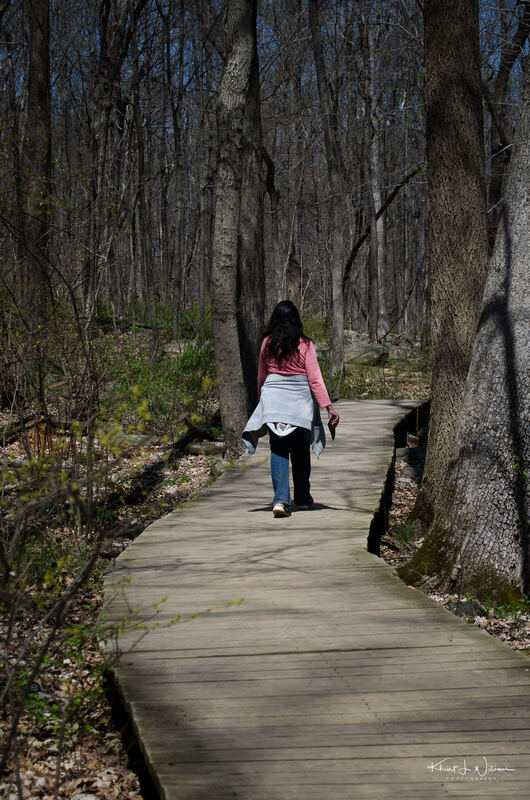 It is a way just to be out and moving enjoying the warmer weather but it is nice to get out into nature while getting some exercise with a purpose. Bhavna walking the boardwalk shortcut back to the trail head. On the Saturday after Good Friday, Bhavna and I decided to hike the other half of the trail to Roaring Rocks Boulders. The day started cooler and cloudier than Friday. The parking lot at the trailhead was almost full to capacity. 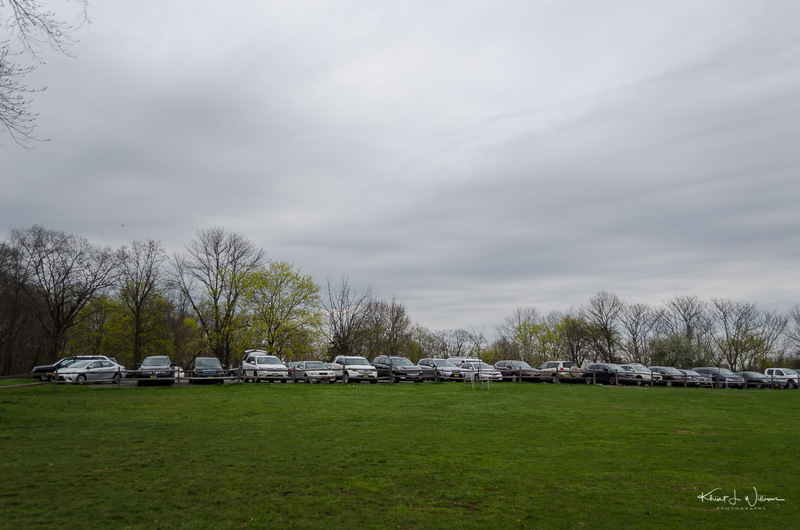 It was an overcast day but the parking area at the Sourland Mountain Preserve was nearly full. Some parts of the trail were muddy but mostly it was dry. On the way back, I strained a muscle in my left foot. I assumed the pain was just from pushing my ankle muscles too hard. Nevertheless, the next morning I awoke with pain in the middle of my foot. We iced it for twenty minutes on and off for the whole day. Monday morning there was a little improvement but Bhavna and I agreed it was time to see a doctor. In any case, our hike to Roaring Rocks Boulders was shortened and we took a connecting trail back to the parking lot. 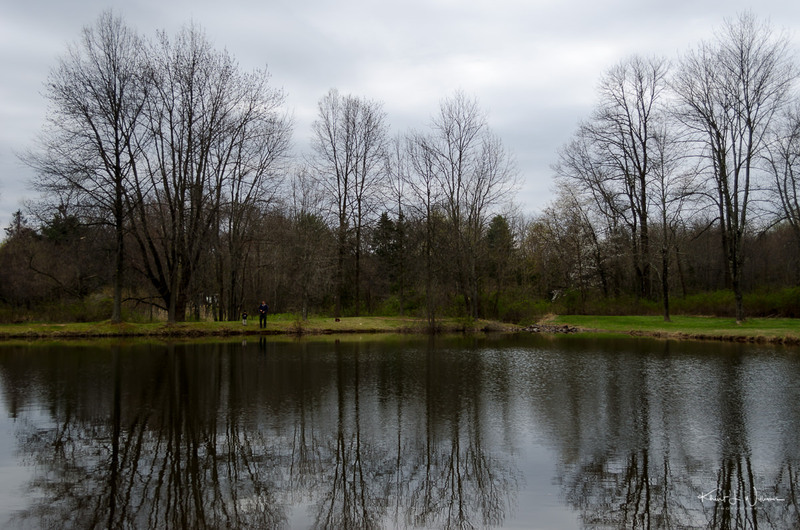 I wished I had brought my tripod and neutral density filter for some long exposure photography of the pond and the sky. Some of the trail had boardwalks which made walking much easier. Some of the woodland plants had tiny new leaves. But mostly the trees were bare and the ground was covered with dead leaves. Need we be concerned with fire? 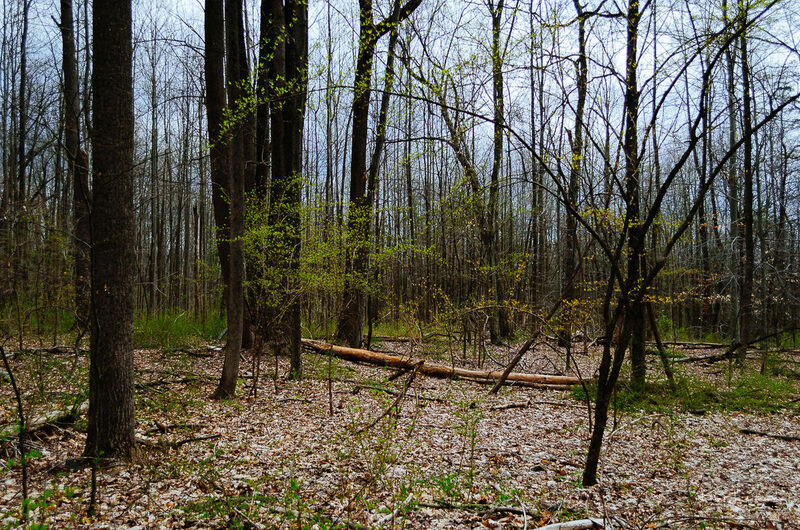 Other parts of the trail wound through the woods. Bhavna and I cross some rocks areas where a stream had formed from run-off from the mountain. My son and his friends. st. Bhavna was quite patient while I found a spot in the middle of the brook from which to shoot. The rocks were slippery and I was at risk of going ankle deep into the water. In the latter part of April, we were invited to celebrate the Hindu spring of Holi hosted by an organization at the Bharat Sevashram Sangha in South Brunswick. Around India, Holi is a lunar calendar harvest festival celebrated in March by Hindu’s of all sects. This year’s Holi was March 1 in India. Spring arrives one month later in the North Eastern USA. In March the weather is too cold and dreary for an outdoor festival that signifies the victory of good over evil, the arrival of spring, the end of winter, and for many a festive day to meet friends and family, play and laugh, forget and forgive, and repair relationships. My wife’s birthday was the same week and this Holi festival celebration makes her birthday special each year. The first year we attended, the celebration fell right on her birthday. It feels like it was just months ago when I held him in my arms. He was so small, pale, and helpless. I worried that I would not know what to do as a father, but that morning a piece of my heart (and Bhavna’s) broke off and became this person. That helpless baby grew into a handsome, warm, caring, capable, man who loves his mother and dotes on his sister. My “baby boy” is eighteen next month. He is graduating from the Montgomery Township high school in June and will be attending the Honors College at Rutgers University where he will be studying biology. The Changing Seasons Monthly Photo Challenge is a blogging challenge by photographer Max a.k.a Cardinal Guzman. Each month I will post a photo that I think represents the month. It’s also a chance to write a narrative of my adventures. Congratulations on the bike, but most of all your son. Good luck at the uni for him. I’ve taken to organization hiking trips with my local friends who are also photographers.